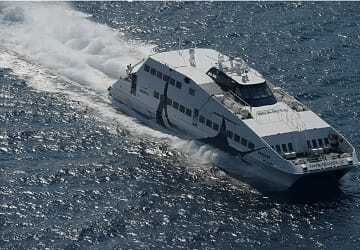 Seajet2 is one of the fastest ferries in the Seajets fleet with a top speed of 38 knots and has a passenger capacity of 394. Seajet 2 operates between the islands of Tinos, Mykonos and Paros. Please Note: Whilst we have taken great care in making our Seajet2 guide as accurate as possible, onboard facilities, services and entertainment may vary depending on the date and time of year that you travel, facilities mentioned may change without notification and ferry companies reserve the right to operate vessels other than those mentioned at time of booking without prior notification. Easy booking on-line, good service. "A nice way to travel"
Incredible punctuality on both ways!!!! Nothing to say about the rest. Absolutely recommend. "Excellent start for an holidays on the islands"
Experience more than positive, we were more than punctual and we had no problems at all. Fantastic ship.. With my GPS I count 40 nodes speed!! Excellent navigation. All excellent obviously there are things that a man cannot anticipate!!!! Clean ship, efficient staff, efficient staff, a bit of delay but it can happen. Compared to other connections, I have to say that SeaJet2 is a really fast ship. Departure was 30 minutes delay but in August it seems to be a insignificant delay according to many. Intern enviroment are clean and the the journey is comfortable. In this days the problem is that the luggages are left outside because is too busy.